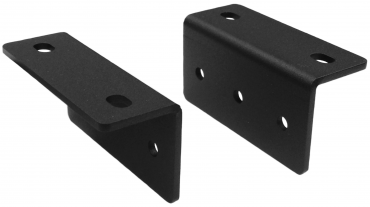 Undermount brackets can be used for under a table, on a wall or above mounting compatible Vaddio 1/2 RU device. Works with: EasyUSB Mixer/Amp, EasyUSB AudioBridge, OneLINK HDMI, OneLINK Bridge, EasyMic MicPOD I/O, EasyUSB PRO MIC I/O and Quick-Connect USB. Contains two (2) black powder coated ears which can be mounted on either side of a compatible 1/2 RU chassis for stable and discreet mounting.